Lit from Within: Beauty is Pain...or at Least A Bit Uncomfortable! I've used some acid facial peels before, and I've used products with Glycolic acid in them before, so I wasn't worried about the 'acid' part of the peel. It sounds scary, but these are natural acids, derived from sugar cane, and are intended for cosmetic use. This was the first time I'd used a product with such a high concentration of acid, though. The most I'd done before this was 10%. This was also the first peel I'd used that used a neutralizing bath of water and baking soda. I made sure I read all the directions - twice - before I proceeded with the peel. I heartily recommend getting all your stuff together before starting the peel. There wasn't a lot of time between me applying the peel and wanting to get it off. Get a timer, and set it for 1-4 minutes, depending on the sensitivity of your skin. Prepare the neutralizing solution ahead of time. I applied mine with a washcloth, but you can also use the gauze pads that are provided in the kit. 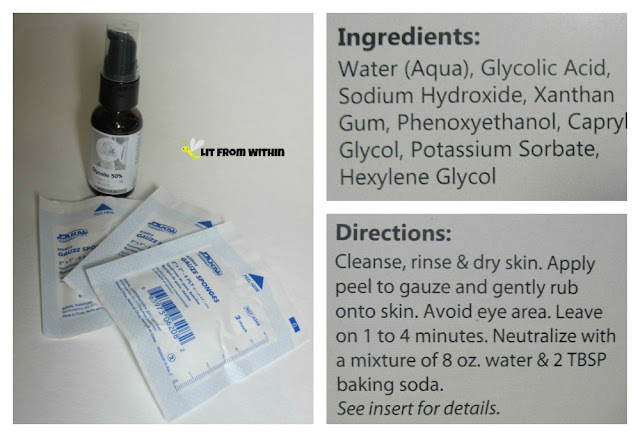 The gel is clear, not runny, but not thick - it's very easy to apply. I love using a brush to apply masks, so I thought that would be a good way to apply this peel. It worked really well for me. A fan brush might be even better. I tried to go the whole 4 minutes with the peel on, but I didn't make it. It felt like needles - all over my face. It wasn't agonizing, but it was really uncomfortable. My skin was pink after I removed the peel, but I didn't experience any skin peeling or any adverse effects. I took a picture 3 days later because I thought that my skin looked pretty good! I wanted you to see what it looked like with no redness. I haven't worked up the courage to do the treatment again, but I'm sure I will - just with a shorter amount of time! 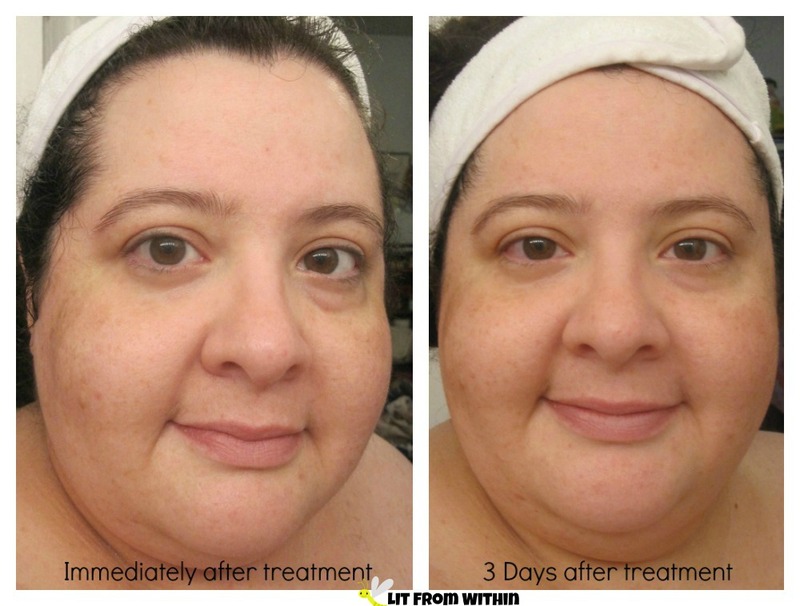 I liked the results, and supposedly after 4 treatments, the results are even longer-lasting. I've tried many things from the OZ Naturals product line, and I really like them. This is the only one that was uncomfortable to use! As a company, they are committed to providing the best organic, natural products that benefit the user and the Earth. All of their products are vegan, and cruelty-free and they don't contain parabens, sulfates, mineral oil, lanolin, gluten, or GMOs. 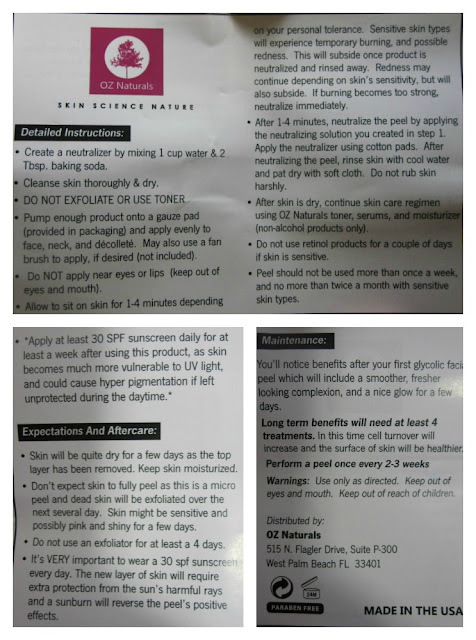 For more information, or to purchase, you can find OZ Naturals on their website, Facebook, Twitter, and Amazon.com, where their face peel currently retails for $24.19. 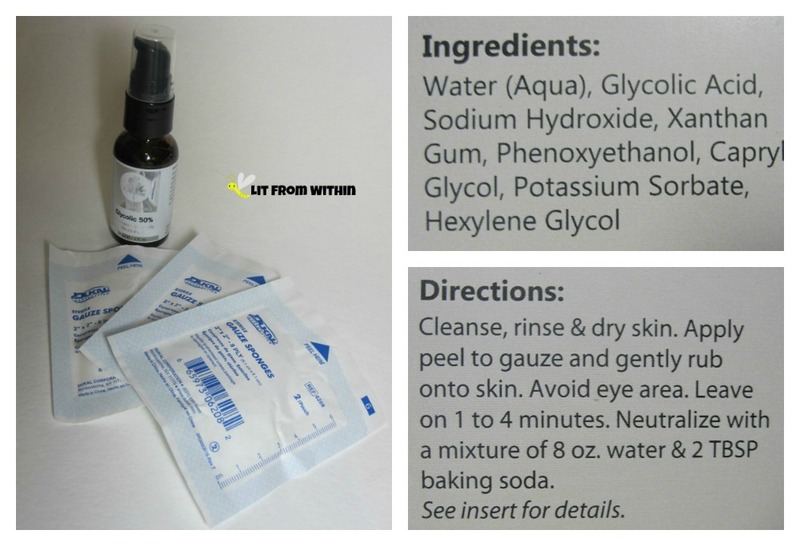 Have you used a Glycolic peel before?